"Prime Curios!" 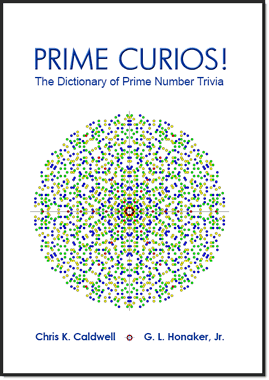 is an exciting collection of curiosities, wonders and trivia related to prime numbers. I have met many folk who could not see the value in stopping to smell a wildflower, collecting a unique coin, or watching the rolling clouds in a spring-time thunderstorm. The old maxim states: "Beauty is in the eye of the beholder." Why not sample a few of our curios and see how our eye compares? This is an evolving collection at the Prime Pages; so we would be pleased to hear your opinions and suggestions. Content editor: G. L. Honaker, Jr.
Our goal is to create a collection (a dictionary if you will) of individual prime numbers with interesting properties or forms. So just what is exciting about the prime 313? What might we discover about 9999999900000001? Since the number of primes is infinite, we can not list them all; but we can list the small ones that are especially curious. Do you know an interesting number we should add? Can you explain your curio in a way that would be understandable to a general audience? In a tone that would make others want to hear more? If so, let us know. Can you find the first missing prime curio? There are currently 22045 curios corresponding to 15368 different numbers in our database, that leaves an infinite number for you to discover! Database last updated 4/18/2019 at 16:37 CDT.